Excellent product and good value for money. Just the colour I wanted.Delivered very quickly and easy to fit. When was the last time you paid any real attention to your toilet seat? Exactly! They aren't an item that is often on our minds, rather something that we just take for granted as an everyday thing we encounter. But upgrading your toilet seat is a fantastic, simple, and cost effective way to improve the look of your bathroom. With that in mind, we know it can be sometimes be a bit of a minefield out there trying to find just the right option, so that's why we've put this handy guide together to help make the process easier. What seat will be right for my toilet? This all depends on a few things really. Your own personal taste will obviously play a part in the general style of toilet seat you go for, but there are other things which need to be taken into consideration too. The material of the seat for example, should complement the toilet and the setting it will be placed in. Plastic seats are ideal for sleek, contemporary units while wooden finishes tend to look more at home in traditional settings. Also be aware that toilet seats have different methods of fixing. Some will feature top fixing hinges while others (normally the more traditionally styled items) will have bottom fixing hinges which use bolts that secure the seat from underneath. The shape and size of the toilet seat is also important (it's no good opting for a standard shaped oval seat if you have a contemporary square toilet for example). If you're choosing a universal fit toilet seat then you need to take some specific measurements, which we'll explain later. There are also toilet seats which have neat features, such as soft closing mechanisms, which are great if you have small children and want to avoid the risk of them slamming the seat on their fingers. You need to think about who is going to be using the bathroom, and choose a toilet seat which is suitable for everyone in the house. Will a universal toilet seat actually fit my toilet? This all depends really. 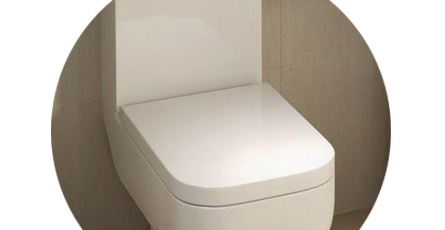 If you're not going for a direct replacement which is designed to fit your specific toilet; instead opting for a universal option, then you need to be careful. To make sure your new toilet seat fits, you will need to take some measurements (making sure they are all accurate). The measurements you need to take are the total depth of the pan (back to front), the internal width of the pan, as well as the width at the widest point, and also the fixing centre distance. These key dimensions will allow you to select a toilet seat that will be guaranteed to fit your toilet properly. First you need to remove the old toilet seat. To do this, simply unscrew either the top or bottom fixing bolts which hold the seat in place and gently lift it away from the pan. Then, place the new seat down onto the pan, aligning it with the bolt holes. Push the bolts through the holes and then tighten the nuts from the underside of the pan. Don't apply too much pressure when tightening though as it will make the seat difficult to remove if you need to change it again in the future.